When you install Brain Cage, suffer 1 brain damage. Your maximum hand size is increased by 3. The skull is not one bone, but 22. The surgery is even more complex than it sounds. I like this card. I'm not sure if it's good, but I definitely like it. It may be a neutral faction card, but it feels more like an anarch card to me. Mostly because so far, the only ways that the runner can inflict brain damage on themselves are anarch. I'm already theorizing about a deck that uses hand-size increasing cards like this card, Public Sympathy, and Origami, along with self-inflicted brain damage cards like Amped Up, Stim Dealer and, of course, Stimhack. But about the card itself. The net result of the 3 hand size increase and 1 brain damage is an increase of 2. The obvious point of comparison is therefore Public Sympathy which has the same net effect. The first thing to note is that Brain Cage is unique, while Public Sympathy is not. If your strategy relies on having a huge hand size (like, say, an Ekomind deck) then Brain Cage alone isn't going to cut it since you can only have one active at a time. Of course you can always run both Brain Cage and PubSym so that's less of a concern. The second contrast is the install cost. Public Sympathy costs 2 to install, while Brain Cage only costs 1. These are both pretty low costs, but Brain Cage is technically lower. However, playing Brain Cage will lose you one of the cards in your grip, as with any damage. That hurts, but since the damage is occurring when the runner wants it to they can mitigate that risk. Still, that's probably worse than the extra credit to install. The third contrast is that Brain Cage is hardware and not a resource. This means that Kate can play Brain Cage for free, and that it's significantly harder to trash. The corp can always mess with your Public Sympathy with tags, but currently there are only five cards in the game that directly target hardware (a handful of Weyland cards, plus Shattered Remains and Flare). If you're running a Prepaid Kate economy, you could feasibly have a deck with no resources at all, just relying on your Plascretes for anti-Scorch protection. However, while you are less likely to have your Brain Cage trashed, the effect is far worse. Losing your Public Sympathy will drop your hand size by two. But even when you lose your Brain Cage, your brain damage stays, meaning your hand size would drop by 3. And with that nice low install cost, it's frighteningly easy for a Weyland player to target it with Power Shutdown--if this is your only 1-cost hardware, then for one credit and one card off R&D that corp can really mess with your strategy. 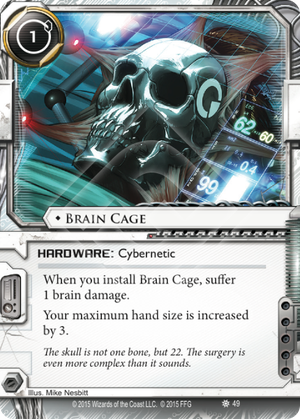 Of course, you could always get your Brain Cage installed by the professionals at the Chrome Parlor, which is great but perhaps not worth the deck space if you aren't already running a bunch of other cybernetics. If the parlor isn't an option but you are really committed to blocking that damage, Feedback Filter prevents this brain damage and one other point on the same turn, although unless the corp is running brain damage ICE this is mostly useless (remember, the damage from Amped Up, Stimhack and Stim Dealer cannot be prevented).